Wind energy is of limited use in the Southeast, where winds tend to be light for much of the year when high pressure is sitting over the region. The most common places to find wind towers are along coastlines or in mountainous areas along ridges. 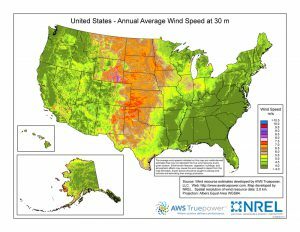 If you are interested in finding more information about wind energy you can check out the references below. Posted in Climate and Ag in the news, Sources of weather and climate data, Uncategorized. Bookmark the permalink.